Well-known to overseas anime and manga fans, miko is the term for the young women that serve the Shinto deities by working in shrines across Japan. Let’s learn more about this fascinating job. Miko, or shrine maiden, is the name of a type of priest working at a Japanese shrine; specifically, young female priests. From time immemorial, miko have been performing kagura (sacred dances), conducting exorcisms, doing divinations, acting as oracles, working as spirit mediums and channeling spirits, and carrying out various other functions as required of them at their given shrine. In modern times, however, miko are essentially tasked with performing kagura and other ritual dances, as well as aiding the priests of the shrine in their functions. Although it is usually written with the characters for ‘medium’ and ‘woman’, miko may also be referred to as miko (神子, written with the characters for 'god' and 'child'), maihime (a title referring to the miko's role of performing sacred dances), and mikanko (meaning "sacred child"). How Do You Become a Miko? 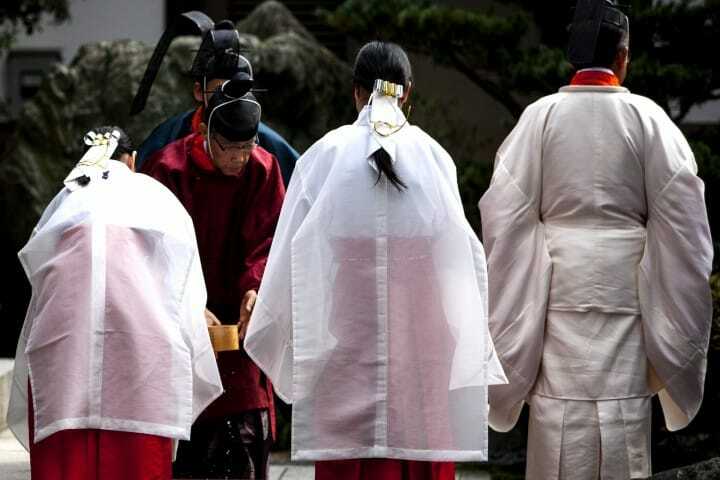 Though there are many miko certified as priests, this is not a fundamental requirement when it comes to becoming a miko. Young women working full time at large shrines are known as Honshoku Miko (principle shrine maidens), but the daughters, nieces, or other young women connected to the shrine may also work there as miko too. Essentially, the only requirements that must be fulfilled in order to become a miko are to be of sound mind and body and to be a young, unmarried female. The retirement age of a miko is in their mid to late twenties. Honshoku Miko who have reached this age wear pine needle green or deep navy blue hakama, or over-pants, and do clerical work or act as kagura instructors to the younger miko. During the New Year celebrations or at other especially busy times of year, many shrines find themselves in need of extra assistance; in these cases they will often hire seasonal workers, which are known as assistant workers or helpers. And with many shrines seeing an increase in the number of international visitors recently, miko who can speak English are also becoming more prevalent. Miko wear a white robe known as a hakui with a pair of red hakama known as hibakama. When performing dances or kagura, miko wear a white chihaya, a loose jacket with long kimono-like sleeves, over their regular uniform. Their long black hair must be tied back in a simple low ponytail, held with either a takenaga, a ribbon made from Japanese washi paper, or a mizuhiki, a cord made from twisted washi under which a sheet of white washi paper is wrapped around the hair. During rites and certain events, miko may also wear special floral hairpieces known as hanakanzashi or special diadems called kanmuri. The flowers, tree branches and floral motifs used in these pieces are representative of the many different types of plants in Japan, which are said to increase the spiritual power of the wearer. The items used during rituals or dances performed by miko are called toributsu, and include 9 distinct things: sakaki (sacred evergreen boughs), nusa (staff with plaited paper streamers), tsue (a wand or staff), sasa (a type of bamboo), yumi (bow - with or without arrows), ken (a sword or saber), hisago (a bottle gourd), and kazura (a type of creeping plant). Depending on the shrine and rite, some also use suzu (bells), ougi (folding fans) and bon (lanterns) as well. As the details of their clothing changes depending on the occasion or season, area, and shrine, there isn’t one correct appearance for a miko. The only strict points are that, in order for their body to be suitable for the deities to use, nail polish, bright make-up, watches, earrings and other accessories are strictly taboo. Can You Experience Being a Miko? Amagasaki Ebisu Shrine in Amagasaki, Hyogo prefecture has a program especially for visitors to Japan called the Miko Experience (reservations required), wherein travelers may learn more about shrines, Shinto and Japanese culture in general. Some large, famous shrines recently have also begun to offer miko experiences or part-time work for visitors to Japan as well. And with the Tokyo Olympics fast approaching and many more travelers heading to its shrines, many locations in the greater Tokyo area are beginning to implement miko experiences and other activities designed with visitors to Japan in mind. If you are interested in taking part in these cultural experiences, please take a look online for them. Tokyo Chuo City Tourist Information Center: Explore Tsukiji And Ginza!